If you work in a particular industry for a while, you start to think you’ve seen it all. That’s certainly true for me. I’ve seen racking tower 40 feet in the air to hold millions of volumes of books. I’ve seen 250 bankers boxes fit into an 8’x8’ cage. I’ve even seen Queen Victoria’s Underpants. But I’ve never seen shelving help to commemorate thousands of women. Walking With Our Sisters is a travelling commemorative art installation that is beautiful, spiritual, poignant, and private. It’s being hosted at MRU’s Riddell Library until May 13th, 2018 and honours the thousands of missing and murdered Indigenous women of Canada and the United States. To fully respect the art, a secluded space was created on the 4th floor using HBI’s movable library shelving as privacy screens. 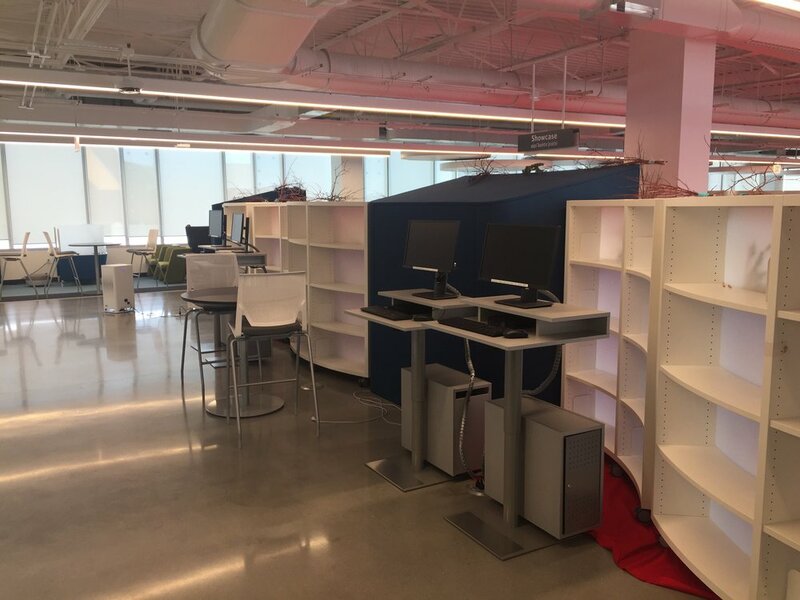 One of the most amazing things about my industry, which is strategic space planning (ie: furniture and shelving), is that a little bit of forethought can bring so much adaptability to a space. When Mount Royal University designed the New Riddell Library, I don’t think they had exactly this use in mind. But they did design a lot of flexibility into their space by choosing products that could do more than what you first think of. Simple things like choosing HBI’s mobile and modern-looking library shelving gave them the chance to do a lot more than store library books – without having to buy additional products. This exhibit is worth experiencing. I’m so glad that I had a chance to see it and consider the reality of what the art commemorates. Since pictures of the exhibit are not allowed, I highly recommend you check it out yourself. You can learn more about the project at walkingwithoursisters.ca and see the Riddell Library Case study here.